NASA's Operation IceBridge calculates rate of Ice loss in Greenland. Research using NASA data is giving new insight into one of the processes causing Greenland's ice sheet to lose mass. A team of scientists used satellite observations and ice thickness measurements gathered by NASA's Operation IceBridge to calculate the rate at which ice flows through Greenland's glaciers into the ocean. The findings of this research give a clearer picture of how glacier flow affects the Greenland Ice Sheet and shows that this dynamic process is dominated by a small number of glaciers. Over the past few years, Operation IceBridge measured the thickness of many of Greenland's glaciers, which allowed researchers to make a more accurate calculation of ice discharge rates. 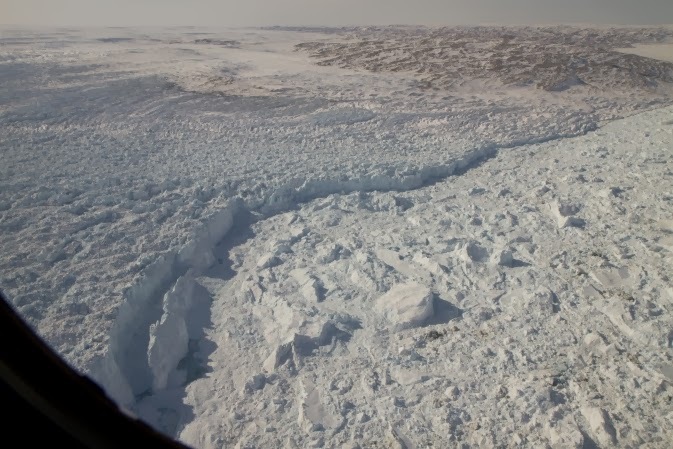 In a new study published in the journal Geophysical Research Letters, researchers calculated ice discharge rates for 178 Greenland glaciers more than one kilometer (0.62 miles) wide. Ice sheets grow when snow accumulates and is compacted into ice. They lose mass when ice and snow at the surface melts and runs off and when glaciers at the coast discharge ice into the ocean. The difference between yearly snowfall on an ice sheet and the sum of melting and discharge is called a mass budget. When these factors are equal, the mass budget is balanced, but for years the Greenland Ice Sheet has had a negative mass budget, meaning the ice sheet is losing mass overall. For years the processes of surface melt and glacier discharge were roughly equal in size, but around 2006 surface melt increased and now exceeds iceberg production. In recent years, computer model projections have shown an increasing dominance of surface melt, but a limited amount of glacier thickness data made pinpointing a figure for ice discharge difficult. Ice discharge is controlled by three major factors: ice thickness, glacier valley shape and ice velocity. Researchers used data from IceBridge's ice-penetrating radar – the Multichannel Coherent Radar Depth Sounder, or MCoRDS, which is operated by the Center for Remote Sensing of Ice Sheets at the University of Kansas, Lawrence, Kan. – to determine ice thickness and sub-glacial terrain, and images from satellite sources such as Landsat and Terra to calculate velocity. The team used several years of observations to ensure accuracy. "Glacier discharge may vary considerably between years," said Ellyn Enderlin, glaciologist at the University of Maine, Orono, Maine and the study's lead author. "Annual changes in speed and thickness must be taken into account." Being able to study Greenland in such a large and detailed scale is one of IceBridge's strengths. "IceBridge has collected so much data on elevation and thickness that we can now do analysis down to the individual glacier level and do it for the entire ice sheet," said Michael Studinger, IceBridge project scientist at NASA's Goddard Space Flight Center in Greenbelt, Md. "We can now quantify contributions from the different processes that contribute to ice loss." With data on glacier size, shape and speed, researchers could calculate each glacier's contribution to Greenland's mass loss and the total volume of ice being discharged from the Greenland Ice Sheet. Of the 178 glaciers studied, 15 accounted for more than three-quarters of ice discharged since 2000, and four accounted for roughly half. Considering the large size of some of Greenland's glacier basins, such as the areas drained by the Jakobshavn, Helheim and Kangerdlugssuaq glaciers, this was not exactly surprising. What they also found was that the size of these basins did not necessarily correlate with glacier discharge rate, shuffling the order of Greenland's largest glaciers. Previously Helheim Glacier was thought to be Greenland's third largest glacier, but this study puts it in fifth place and adds two southeast Greenland glaciers, Koge Bugt and Ikertivaq South to the list of big ice-movers. Glacier thickness measurements and this study's calculation methods have the potential to improve future computer model projections of the Greenland Ice Sheet. And with a new picture of which glaciers contribute most to mass loss, IceBridge will be able to more effectively target areas in future campaigns, promising more and better data to add to the research community's body of knowledge. George Hale NASA's Goddard Space Flight Center, Greenbelt, Md.